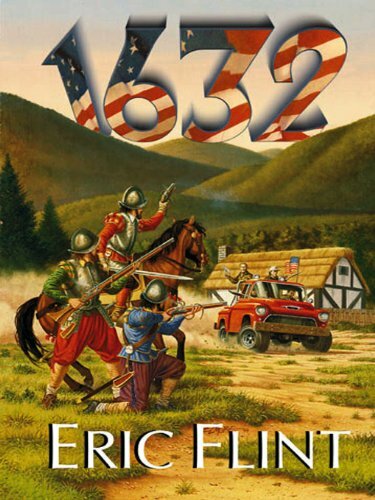 The Eric Flint novel 1632 (Ring Of Fire) (Free on Amazon as Kindle Edition as of now, Feb 2014) is the first in a series of alternate history books from Eric Flint and other collaborators. In the novel, a fictional town from the year 2000 in West Virginia is transported in time back to 1632 and creates a new timeline. The town is mostly self contained and as such has a lot of tech (power plant, guns, mine, machine shops) that allow the hillbillies from Grantville to make a stand in war torn Germany (the location that their chunk of America is transported to). In Germany, the continent is almost half way through the 30 years war. This is the setting for 1632 where a small town of hillbillies decide to recreate America, only in Europe, 368 years in the past. The concept of taking a chunk of land and it's occupants and misplacing them in time and space on the Earth. The use of modern technology to decisively win battles in a time when guns were just starting to be used but which had a terrible fire rate and almost no accuracy. Chapters that explained historical battles were dry and out of place in the story telling. They just felt different. I would have taken the sometimes long, multi-chapter discussions of historical battles and turned them into reports from Scouts/Spies. Using the Scots Calvary more as liaisons between the new American State and Kind Gustavus Adolphus. This could have made the dry historical battles (which I enjoy but which seemed out of place in the writing) fit more seamlessly into the story. This being a larger series, I can not wait to read more. That said, the series does not advance many years and stays stuck in this time period so hopes of seeing tech advance with this modern boost may not be something I get to see which I would like. What happens in 2-4 years when parts have run out and things don't work any longer? What types of old tech which was easier to produce would come back in style? Would steam trucks make a comeback? Would gasoline production be broke forward and created to help the Americans to continue to drive their vehicles? What happens when the railroad comes? This is an interesting piece of sci-fi with time travel, military sci-fi, and alternate history all colliding. What's with the candy? Where are the Veggies?